This is part of an ongoing educational series on essential oils. Today’s topic is all about aromatherapy oils for sleep. In previous parts of this series I have talked about, beating bad moods with Bergamot essential oil, releasing grief with Ravintsara essential oil as well as the top essential oils for dry skin. Stay tuned for more! Today I am so excited to share a whollllle bunch of amazing aromatherapy diffuser recipes. All of the recipes below are specifically for helping you have a great night’s sleep! I am providing tons of recipes, because we all have different oils on hand and also are drawn to particular oils. All of these recipes have been used by friends, or myself to help them get a good night’s rest. Going with the gut when it coming to essential oils is what I usually do- if something sounds awesome I try it! So if you find yourself really wanting to use a certain oil or recipe, go with it! I take an empty and clean oil bottle and add each oil you want to use, for recipes from below, just multiply them out for larger batches. Close the lid and swirl the bottle gently. This allows the oils to create a synergy. For best results, leave them in the bottle for a day or so to mix. If you are just testing out different recipes you can mix the oils in the diffuser. I try and add the oils to the bottom of the diffuser first to let them mix before adding water, but you can do it after as well! Letting the oils mix create a synergy, where the sum can be greater than the parts! Remember the below recipes are just a guide. You can half, double, triple etc… any blend below! Have fun with it! If you are experimenting and truly want the oils to mix before you add to the diffuser you can get some mini oil bottles on amazon for your experiments. Here is the bottles I have. I also use empty bottles of oils as well, if you have an empty bottle of one of the oils from the recipe that is even better! Some of the recipes use more drops of oil that I would like to use in the size diffuser I have. In that case I would mix in a bottle and then add 3-5 drops, depending on the blend, to my diffuser. I have this dew drop shaped diffuser and add 3-5 drops of oil to it when full. If you are looking for a diffuser that runs all night, try the Rainstone diffuser. I am so lucky that the founder of Young Living, where I buy my oils, is a master of essential oils, and the science behind them. As a customer I have access to many pre-mixed blends.. aka synergies. Some great ones for supporting your sleep are Peace and Calming, Peace and Calming II, RutaVaLa, and Stress Away, just to name a few. I personally believe that these blends are so amazing, they should not really be messed with. Someone a lot smarter then me came up with this and they are precisely mixed for their purpose! However, what you can do is bump a blend. This means adding one other additional oil to the blend. Everyone’s bodies respond to essential oils differently, so experimentation is often needed to find our sole mate blends! You will see tons of recipes of blending blends. I am always happy when people are using and trying new things with their oil, but I find that to be a waste of good oils. Just something to think about! Aromatherapy Oils for Sleep Support! 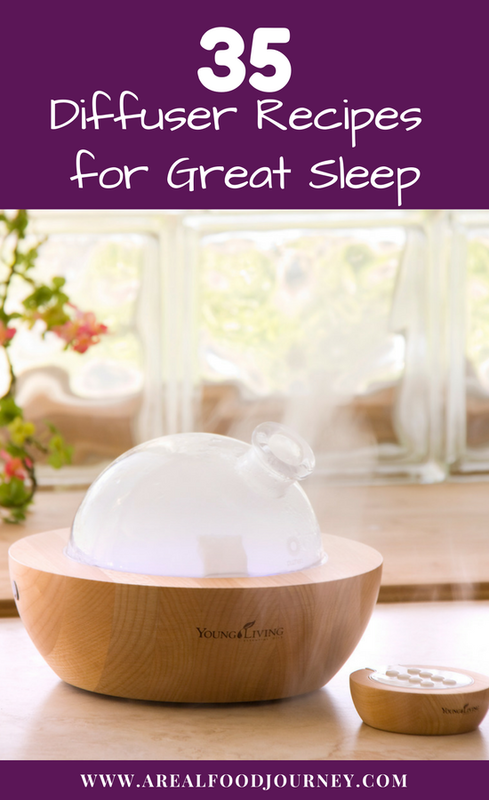 I hope this list of aromatherapy oils for sleep support you in restful slumber!! Give these oils a try and you will not regret it!